Jez Nelson presents avant-garde trumpeter Wadada Leo Smith in a concert with some of the UK's finest improvising percussion players. 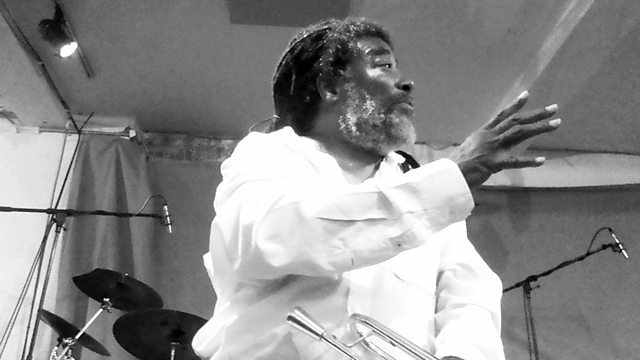 With over 40 years on the clock as a premier avant-gardist, American trumpeter Wadada Leo Smith is still breaking the mould. He performs here in an unusual line-up featuring leading British improvisers. Smith is joined by two drummers Charles Hayward and Steve Noble as well as Orphy Robinson on electric vibes. Wadada treats his trumpet to live effects and processing, giving the gig a dark yet energising edge, reminiscent of Miles Davis's electric period. Producers: Peggy Sutton & Phil Smith. The Very Best of Diana Krall. All Art Jazz / Candid. The Audience with Betty Carter. Hello Earth. The Music of Kate Bush. Clap Hands, Here Comes Charlie!.